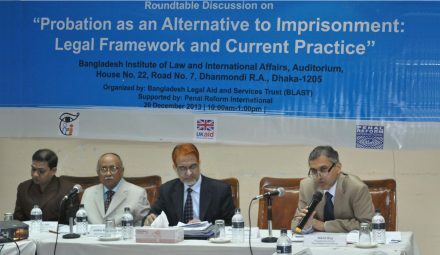 PRI’s Programme Development Director, Nikhil Roy, recently visited Bangladesh and spoke at a roundtable discussion on Probation as an Alternative to Imprisonment: Legal Framework and Current Practice, organised jointly by PRI and our partner in Bangladesh, the Bangladesh Legal Aid and Services Trust (BLAST). Here Mubinul Mulk, BLAST Research Associate and Nikhil discuss the prospects and priorities for reform in Bangladesh and what the PRI/BLAST partnership hopes to achieve. How is PRI working with BLAST to promote penal reform in Bangladesh? PRI is working closely with BLAST to promote reforms in both the management of prisons, as well as in the development and use of alternatives to imprisonment. As regards prison management, PRI and BLAST are working together is to bring about better understanding and implementation of human rights practices in the prison context, and to help ensure good practice in the treatment of vulnerable groups especially women and children. In terms of non-custodial alternatives, our aim is to promote better understanding and effective use of measures such as probation and community service. How can we enhance cooperation among relevant stakeholders in Bangladesh? Criminal justice reform requires the support of a range of stakeholders including Government, judiciary, lawyers, police, prison authorities, media and civil society. With this in mind, PRI encourages a coordinated approach in all its activities, seeking support from the Government and prison authorities in making improvements in prisons and involving the judiciary in discussions about existing provisions in the Penal Code for alternatives to imprisonment. In your view, what is the scope for penal reform in Bangladesh? There is great potential for penal reform in Bangladesh. Conditions in prisons are poor with severe overcrowding and alternatives to imprisonment are currently rarely used, but nevertheless possibilities for reform do exist. There is support from all key stakeholders for pushing forward reform measures and there is also the possibility of better utilising existing legal provisions to bring about these changes. New laws such as the Children Act 2013 are also very helpful in this regard as they show the commitment of Government to bring about change. Please give your views on which of the various alternatives to imprisonment you feel may be easiest to use in Bangladesh or in South Asia? There are several measures which can be used as alternatives to imprisonment. Simple measures such as admonition, cautions, fines and bails applied rigorously would have a big impact in helping reduce the large numbers of people arrested and imprisoned pending trial. Another alternative which should be seriously considered in Bangladesh is the use of community service. Some new legislation may be needed to ensure this measure is properly established in law but once developed and properly implemented community service can be very effective for justice delivery purposes. Good practice on this issue can be found in the state of Andhra Pradesh in India, where a few years ago the Andhra Pradesh Community Service of Offenders Act 2010 was adopted by the state assembly and discussions are currently underway on its implementation. Finally, the provision for using probation already exists but is not properly resourced or used. This should be taken up as a matter of urgency. How can BLAST promote greater use of alternatives in Bangladesh? BLAST is already helping promote the use of probation in Bangladesh through research, awareness raising and engagement with key stakeholders in the criminal justice system. The forthcoming report on the Development and Use of the Probation System in Bangladesh will help to raise awareness of probation measures amongst all key stakeholders. I understand that BLAST is planning to encourage and monitor the use of probation orders in various districts during 2014 and recording some of the key challenges which need to be addressed in order to improve use of this measure throughout the country. What do you see as PRI’s key achievements in reforming prison systems in South Asia? Agenda setting: PRI together with its partners played a major role in helping shape the penal reform agenda in the region through preparation and delivery of two major conferences in Kathmandu (1999) and Dhaka (2002), bringing together a wide range of stakeholders and setting out some key recommendations and prioritising reform issues. These included practical measures to address the problems of overcrowding and developing and implementing the use of alternatives to imprisonment. Assessing and documenting effective intervention models for accessible justice: PRI helped to document both the Madaripur Model of Mediation in Bangladesh and the system of Open Prisons in India, as models of good practice in the region. Capacity building for prison personnel: several initiatives have been undertaken by PRI in all countries in the region to build capacity of prison personnel and raise awareness of the importance of good principles of prison management. Support for vulnerable groups of prisoners: PRI has worked closely with partners in South Asia to improve conditions for women and children detained in prisons throughout the region. The Bangladesh Legal Aid and Services Trust (BLAST) is the largest dedicated non–governmental national legal services and human rights organisation, established in 1993 following a resolution of the Bangladesh Bar Council. PRI and BLAST are working together to develop and promote the use of international standards for the administration of criminal justice, reduce the unnecessary use of imprisonment and promote the use of alternative sanctions of punishment where appropriate in Bangladesh. Read the executive summary of BLAST’s new report on the Development and Use of the Probation System in Bangladesh. The full report will be available shortly.